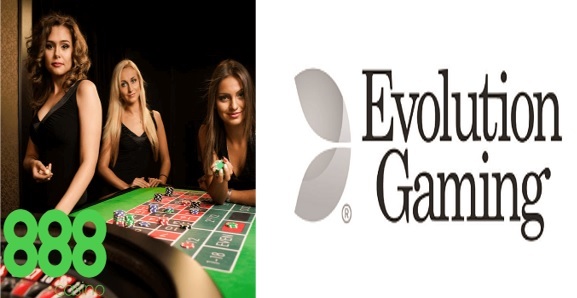 888 Casino, one of the world’s leading online casinos, has added the new range of Evolution Live Dealer Games to its game selection line-up to be launched soon. The decision has been made by 888 Casino to improve its range of Live Dealer Casino offerings for their many clients worldwide by integrating into their network the entire Live Dealer Casino game portfolio of international Live Online Casino game developer expert, Evolution Gaming. 888 Casino will soon be offering a completely new range of Live Casino games, including some of Evolution’s latest range of games like Lightning Roulette, No Commission Baccarat, and its exclusive Salon Privé for VIPs. As one of the largest brands in the Online Casino industry, 888 Casino’s new live dealer games will be launched through its gaming channels over the next few months. These new Evolution titles are anticipated to appeal to Live Dealer Casino fans worldwide. Who are Evolution Gaming and What Do they Do? In the online casino world, the software developer, Evolution Gaming, has a seriously big presence. So, why haven’t you heard of them? As they only concentrate on one specific area of your favorite Online Casino – the Live Dealer Casino – their name is not as widely known as the big slots game developers like NetEnt, Playtech and Microgaming. If you haven’t played at many Live Dealer Casinos yet, you’re probably not likely to have played one of their games. When you do eventually find your way into a Live Dealer Casino, the chances are you’ll encounter their games very quickly, as they are the Live Dealer Casino industry leaders in game development and production. New players will enjoy that they’ll find Evolution Gaming’s games as completely fair, intuitive and very easy and fun to play. Other than 888 Casino, you’ll find games from Evolution Gaming at a huge number of different online casinos, and these include some of the biggest names in the industry, such as William Hill Casino and Karamba Casino. Like most of the best online casino game developers, Evolution Gaming have no intention of resting on their laurels and they continue to innovate and create fantastic new and inventive games, which are enjoyed by millions worldwide. Game details of ‘Lightning Roulette’ are still sketchy at this early stage. As the game name suggests, ‘Lightning Roulette’ is possibly the most exciting of the new game products to look forward. Neither 888 Casino nor Evolution have yet released many details of the new game, however, fast-paced action in the elegantly crafted and swanky virtual live environment we’ve already become accustomed to with Evolution should ensue. What we do know is that the new ‘Lightning Roulette’ will feature random multipliers, which seems to suggest a big winning potential on any particular single spin. It will be interesting to see what the delivered finished product might resemble, however, initial announcements sound very exciting. In addition to the new roulette game, 888 Casino announced some other innovations to their Live Dealer Casino coming up later in 2018. As well as the brand-new Roulette game, 888 Casino has also opted to add Evolution Gaming’s exclusive Salon Privé live gaming product to its sites. Salon Privé offers players a unique, private and exclusive gaming experience at the VIP level and caters to high rollers, perfected with extended bet limits and other refined features. The Salon Privé will consist of live games of Roulette, Blackjack, Poker and much more. Evolution Gaming’s Salon Privé will also offer 888 Casinos ‘Super VIPs’ the same glamorous experience that they would enjoy at the salon privé of their favorite land-based casino. In this devoted gaming area, loyal 888 Casino players will receive a level of quality service that until now has been unavailable in the Live Dealer Casino environment. It will be a similar high standard to what is currently found in land-based casinos, where VIP patrons receive their own dedicated gambling rooms to enjoy their gaming experience to the absolute fullest. Fans of Live Baccarat will be pleased to hear about the 888 Casino decision to also incorporate Evolution Gaming’s No Commission Baccarat tables. It will be very interesting to see the game in action, as no commission tables should seriously improve the players’ bottom line and be a potential ground-breaking development for the Live Dealer Casino environment and for the Online Casino Industry in general. The New Evolution Gaming products should be rolled out at 888 Casino over the coming few months. Exact game release dates are not known at this stage; however, we’re anticipating that sometime in the second or perhaps even third quarter of 2018 should see the new games arrival on the floor of the 888 Live Dealer Casino. When playing at 888 Live Dealer Casino, you feel transported, literally as if you have been ‘teleported’ into the pit of a real live bricks-and-mortar casino. The energetic atmosphere of in-house Casino Play has been perfected in such a way that there is no requirement for you to leave the comfort of your own home or to incur any expensive and pocket-emptying travel and accommodation costs. You have more money in your pocket to play your favorite games. 888 Live Dealer Casino is a great one, but it is not alone. There are many other excellent quality Live Dealer Casinos, all slightly different in character. Most importantly, when choosing a Live Dealer Casino, the most crucial consideration is to play at a reputable, licensed and trusted online casino, such as our recommended Online Casinos for Canadians like; PornHub, Karamba, Go Wild, Betway, Jackpot City, William Hill, Spin Palace, Royal Vegas, Ruby Fortune, 888 Casino and All Slots Casino.